Each practice test download offered below contains (1) a pencil/paper practice test and (2) a key to score your own test. THE GOOGLE CHROME INTERNET BROWSER IS BEST TO PURCHASE ANY PRACTICE TESTS FROM OUR WEBSITE! After reading these instructions, please choose the practice test that you desire by clicking on the button: “Add to cart”. On the shopping cart page, please confirm you have ordered the correct materials then click on the button: “Proceed to Checkout”. 6. 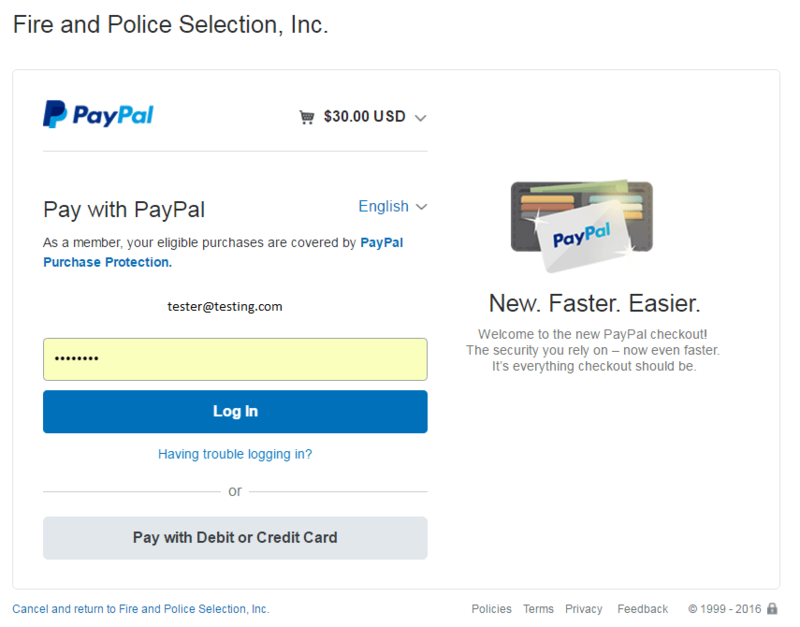 FOLLOW THE PAYPAL INSTRUCTIONS AND ENTER ALL INFORMATION PROMPTED BY PAYPAL IN ORDER FOR YOUR PAYMENT TO PROCESS CORRECTLY!! 7. Once payment is submitted, you will automatically be redirected back to the FPSI “Order Details” checkout page to access your downloadable practice test per Step 3 below. You will be emailed a transaction receipt ONLY…the test will not be emailed, mailed, or shipped. 1. Once you are back on the FPSI Order Details checkout status page, your one-time instant download will be a blue link in your order details under the product/name of the guide. For example, your download link will look like this: Download file: NFST Candidate Orientation Guide. 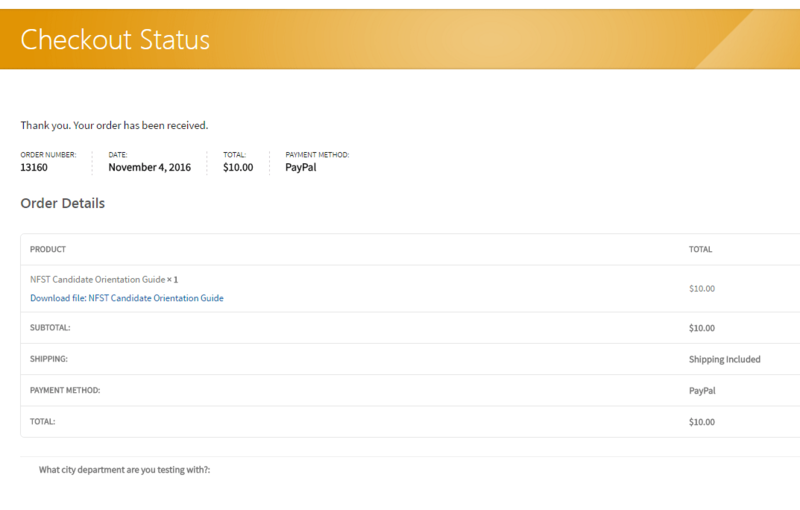 Remember, practice tests are not emailed, shipped, or located on the PayPal website as they are located on this checkout status page only! 2. Once you click on the blue link, your Adobe Acrobat .PDF DOCUMENT file will either open up automatically in a separate browser tab OR it will appear as a file to download on the bottom left corner of your screen. Please pay attention to how the file opens! 3. After you open the file, you MUST save it on your desktop or print it out to have access to it again. DO NOT CLOSE THE CHECKOUT STATUS PAGE, BROWSER, or FILE without saving or printing your PRACTICE TEST FIRST! DO NOT LEAVE THE TEST OPEN ON YOUR BROWSER either as you will lose it and you will not have access to the file again!! IF YOU CANNOT FIND YOUR BLUE LINK ON YOUR ORDER DETAILS CHECKOUT PAGE PLEASE CONFIRM YOU FOLLOWED INSTRUCTION NUMBER 2 ABOVE. IN ORDER FOR US TO ASSIST BUYERS WITH ORDERS RIGHT AWAY, PLEASE EMAIL HELP@FPSI.COM (OR CALL 916.294.4242 X123). DO NOT CLOSE THE CHECKOUT/ORDER DETAILS PAGE BEFORE YOU EMAIL OR CALL. This will ensure FPSI Support can assist you with your order. 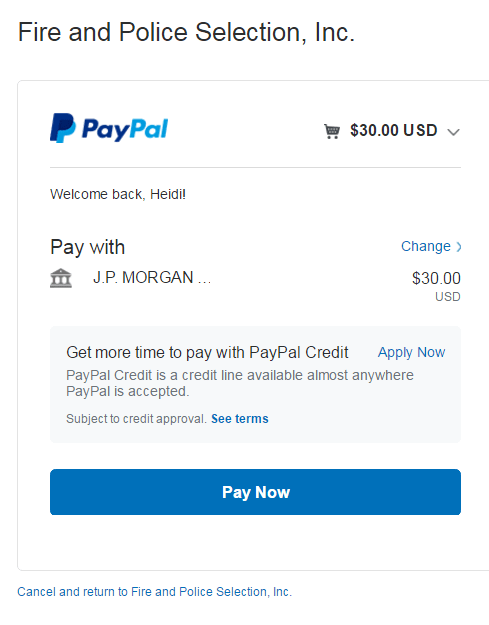 ALSO, PLEASE DO NOT DISPUTE YOUR CHARGE IN PAYPAL…WE MAKE CONTACTING US VERY ACCESSIBLE AND WE WILL RESOLVE EVERY ISSUE THAT YOU PRESENT TO US. Please know, if you place an order on the weekend, there may be a delay in support. During business hours we will reply with support via an email or phone call within a 24 hours or by the next business day. The Certified Firefighter Human Relations Practice Test above is ONLY appropriate for people who have been told to study IFSTA Essentials of Fire Fighting, 6th Ed. and Brady’s Emergency Care, 11th Ed. by the Fire Department or City they are testing for. This is a job knowledge test that requires studying of the two books mentioned. There is NO study material for the Human Relations section. The Certified Firefighter Human Relations practice test contains 70 multiple-choice questions with an answer key. The Certified Firefighter Practice Test above is ONLY appropriate for people who have been told to study IFSTA Essentials of Fire Fighting, 5th Ed. and Brady’s Emergency Care, 10th Ed. by the Fire Department or City they are testing for. This is a job knowledge test that requires studying of the two books mentioned. The Certified Firefighter practice test contains 85 multiple-choice questions with an answer key. If you have questions or need help with an order, please email help@fpsi.com. These practice tests are also available online. If you are interested in taking a test online, please go to the online test section of the FPSI website. Please know, these practice tests are exactly the same as the online one that is available. We will not give refunds if you elect to purchase all of our available practice products.